I have never liked cheese. Only as a slice on a cheeseburger, or on a plain pizza. All the fancy cheeses just grossed me out. The thought of moldy, fermented cow milk was never anything I really wanted to try. But now, as a vegan, I am really excited to try out all these new cheeses! They are not gross at all, and, ironically I’m learning all about different cheese now that I am vegan. What does all this have to do with Vtopia? Well, for starters, it is Portland’s first all vegan cheese shop. For seconders (is that a thing?) they have an incredible deli that let’s you try all their cheeses in their glory. Kristin and I pointed the Jeep at Vtopia, and headed to NW Portland for some lunch. I didn’t feel like dinner. I felt like some vegan sin food. And I was longing for those old school, bad-for-you velveeta experiences. 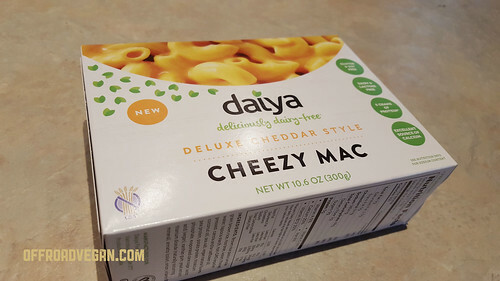 While roaming the aisles tonight at Food Fight, I decided to try the new Daiya Cheezy Mac and grabbed a box. Here is the link from Food + Wine. Days later, Ronnen was in Boston promising to put his life savings into the project. He and Brown convinced Casino to move to California and lined up investment from Khosla Ventures, a Silicon Valley venture capital firm specializing in green technology. Jean Prevot, director of operations for Laura Chenel’s Chèvre, also joined Kite Hill to help them design and build a production facility in Hayward, California, just a few hundred yards from the eastern shore of San Francisco Bay. Cathy Strange, the global cheese buyer for Whole Foods Market, tasted the Kite Hill lineup earlier this year. “I loved it instantly,” she says. “I could taste the culture, the rind. I’ve never, ever seen this kind of texture in an alternative milk product.” As a result of that tasting, Kite Hill reached a deal to retail exclusively through Whole Foods.